WILLEMSTAD - The Netherlands wanted to assist in the deal with the Chinese State Company Guangdong Zhenrong Energy (GZE). 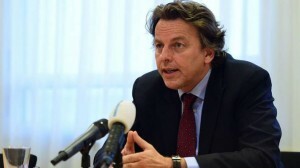 That's what the Kingdom Foreign Minister Bert Koenders wrote in November of last year to former Prime Minister Dr. Bernhard Whiteman. The letter came became public recently, The Netherlands has provided assistance from professional, financial and legal advisors. The Whiteman cabinet did not accept the help and ten days later, the agreement was signed with the Chinese company.